Well cricket is back this week!! Tomorrow night in our Club Rooms, we will be having Super Burgers and sausages. With our U12 and U18 teams having byes for the next two weeks, and our U14 and U16 teams playing away, it will still be great to have those families come to our rooms afterwards. Please come upstairs, and enjoy hearing how our Juniors are going. Tomorrow night, we will be having our two Super 7 teams play some match simulation as part of their training. Our U18 team are encouraged to come and assist with the organizing of the match (I know Kev will be there) – especially as our Super 7 coaches will be taking part in the ‘Coach the Coaches’ session (see below)!! As I mentioned last week, with the unusual situation of not having any matches at home for the next two Fridays, we are taking the opportunity to do a few different things. It has been a great response by coaches/parents to attend the ‘Coach the Coach’s session’ – being run by Club Coach Rob Ferdinands. Last week I advised the course would start at 6.00pm, however we are looking to make this a 5.30pm start – which will finish around 8.00pm. If you are still interested in attending, please let me know. I will be sending an email out to all those who have advised they are attending later this morning. If you do not receive this from me, please let me know (as I may have inadvertently left you off my list)! Last week when I mentioned Representative Cricket, I omitted Harini Piduguralla. Harini, who plays in our Girls Team, played in the under 14 Youth Premier League. The team went on and won the Grand Final. Congratulations Harini !! Also since last week, Jim Jessup and Max Waburton, played in the Grand Final of the U15 Shield team for Box Hill. Whilst the team were eventual Runners Up (a great achievement), both Max and Jim had strong impacts on the match. Finally for this week, Eloise Wood (who is a young U12), represented BHRDCA in U12 Girls Rep team. Her team also made the Grand Final – where Eloise took three wickets! This is an amazing effort – Well done Eloise. 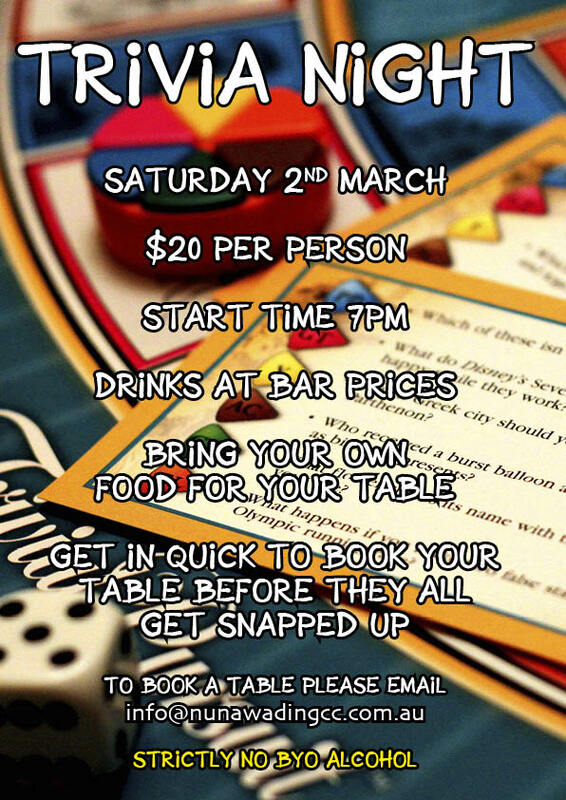 The Clubs annual Trivia Night is on Saturday 2 March (Flyer attached). As many would know, this is always a fun event – that many Junior families go to. Please refer to flyer attached with more information. Please don’t feel like you need to get a full table to attend – even a small group will work well!! ‘We have been made aware that Melbourne Stars promotional LED wristbands containing button batteries contain small parts that could cause severe risk of injury if ingested by small children.We recommend any Stars fans who collected the wristbands to immediately and safely dispose of these wristbands by wrapping in paper and disposing in household rubbish’. Our Junior Presentation evening, will be on Friday 15 March. Please lock this date in your calendars – more details in coming weeks.